Eiscafe Venezia @Schwarzwald City (Freiburg, Germany) | Get Your Grub On! I was in Freiburg im Breisgau for the weekend and since it was an extremely hot and sunny day we were looking for something cooling, so my two lovely friends brought me to ‘Eiscafe Venezia’ in the middle of town to enjoy something which I only have seen in Europe. 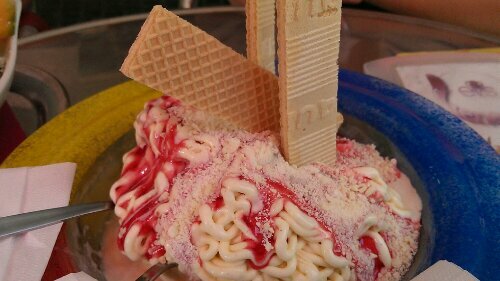 We ordered ‘Spaghetti Eis‘ (spaghetti ice cream) which I, at least didn’t have since I left Germany five over years ago but probably for much much longer. The “spaghetti” were made of super soft and fluffy vanilla ice cream that obviously melted away. Hidden underneath was a layer of cream which awesomely half way froze so I had delicious little cream bricks as a bonus and this all was covered with a very fruity yet not too sweet strawberry sauce sprinkled with white chocolate shavings as a visual parmesan substitute. The place itself is nothing too special but for a quick sweet cold fix on a hot day I also didn’t pay to much attention to be honest, ‘Spaghetti Eis‘ on the other hand, just what I needed.